As my blog entry title suggests, this is the ultimate foodie experience I've had thus far. 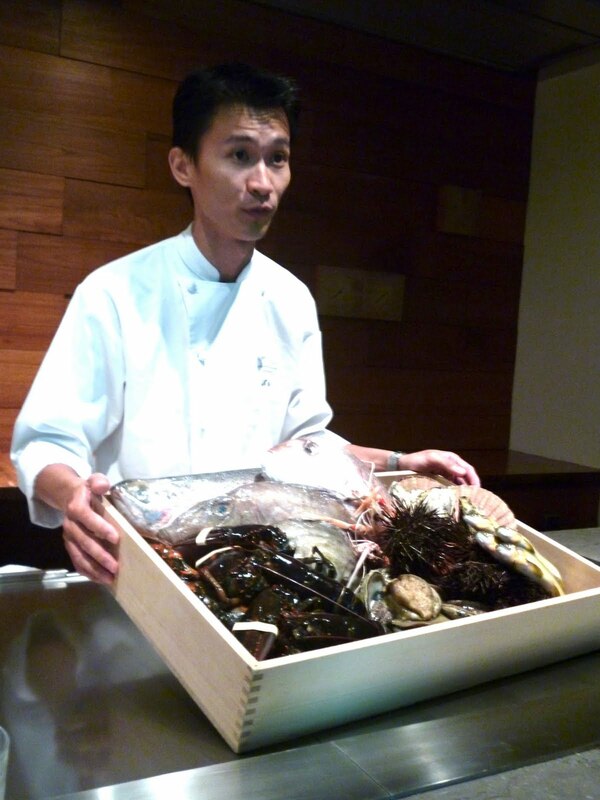 Waku Ghin is a fine dining Japanese restaurant located at Marina Bay Sands. I first heard about this restaurant from a friend in Australia. 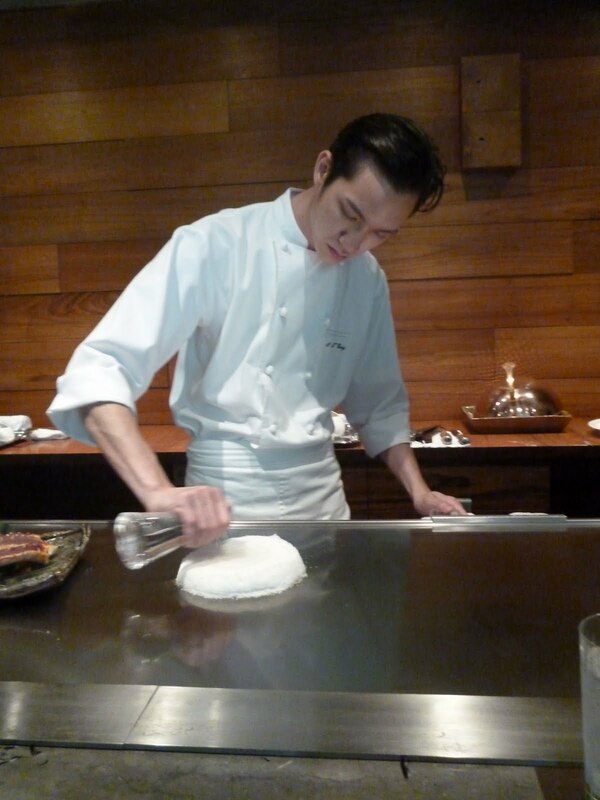 Chef Tetsuya Wakuda (the owner) is a well renowned celebrity chef in Australia, with his restaurant Tetsuya's needing 6-months advanced booking. I finally had the chance to try them out after a bunch of foodie friends came over to visit in Singapore. The restaurant is very exclusive -- you will of course need a reservation, and you will also need to provide your credit card details and send a signed form via email or fax as guarantee. I guess with the amount of premium and fresh ingredients they have to purchase for the dinner, they would be losing a lot of money if people cancelled at the last minute. Waku Ghin only offers a 10-course degustation menu priced at SGD 400 per person. Yes, it's very pricey, but I felt it was worth every penny. 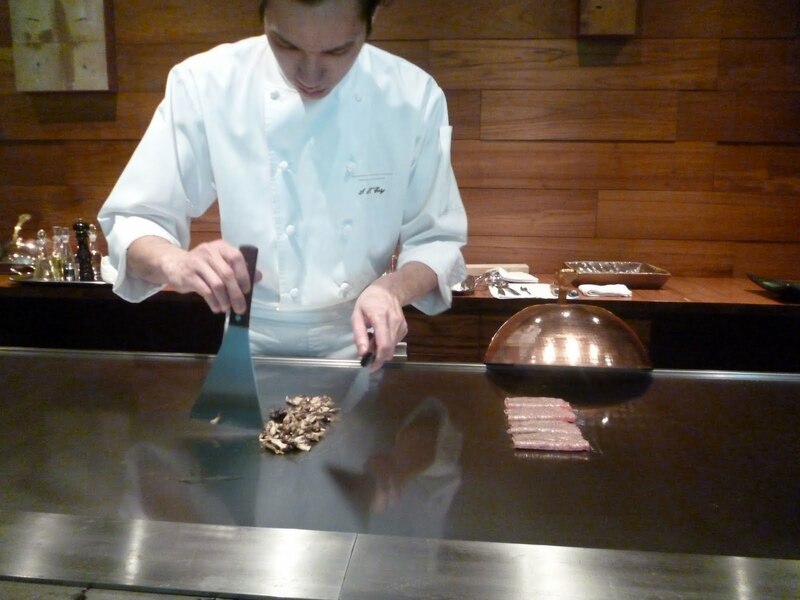 The meal takes about 2 to 3 hours, where the starters and main course are served at a chef's kitchen. 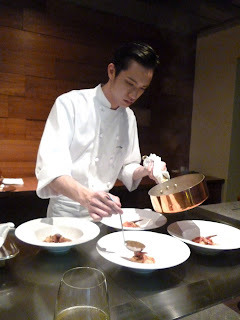 Our chef was Chef Cory Soo Thoo. He took the time out to carefully explain each and every single ingredient, where it's sourced, and how he will cook it. The entire experience felt like an entire culinary journey. The meal started out with one of the chefs showing the types of seafood the they will be cooking for us. They ask as well if you have any allergies to any of the food they will be serving. Thankfully, I can eat anything! 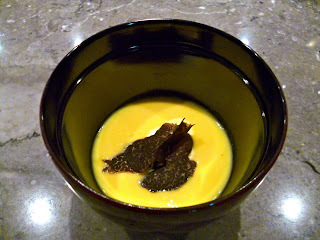 The first dish served to us was the Cold Soup of Japanese Sweet Corn with Safron Ice Cream and Australian Winter Truffles. This was a very pleasant tasting dish. You could really taste the sweetness of the corn and the savory ice cream. 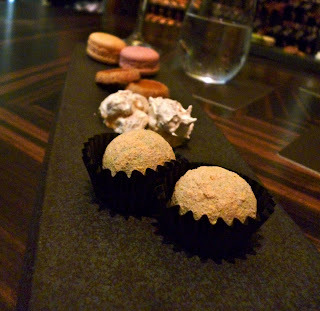 The truffles tasted a little bit more "woody" than the types of truffle I'm used to, which was actually very good. 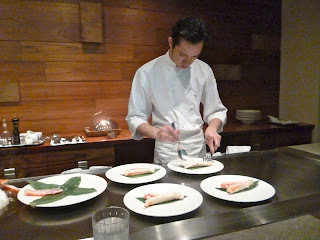 The next was a signature dish of Chef Tetsuya, the Marinated Botan Ebi with Sea Urchin and Oscietre Caviar. Wow, this dish was definitely a masterpiece! I have never tasted such sweet shrimp. 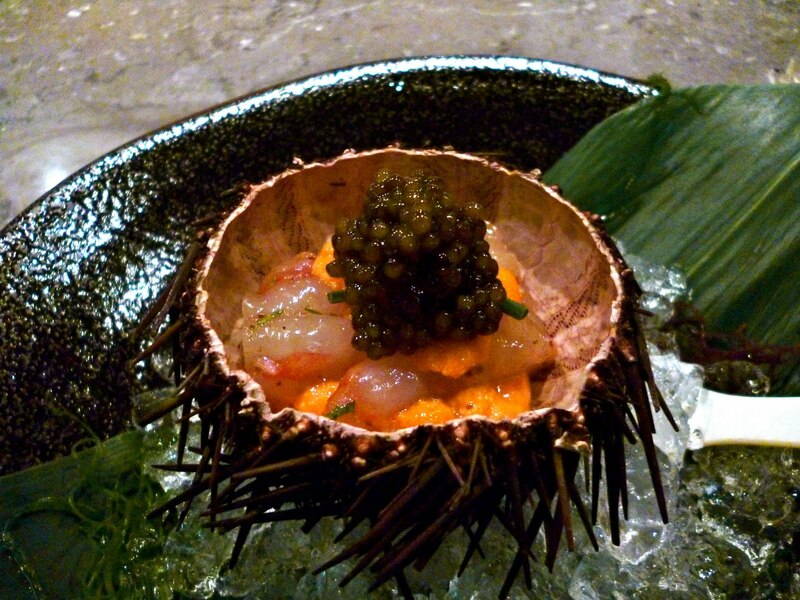 And the sea urchin and caviar were simply amazing. This dish was superb! What followed was another fabulous appetizer which was the Charcoal Grilled Tasmanian Petuna Ocean Trout with Marinated Witlof. I am normally not a fan of grilled fish as I find that grilling brings out the "fishiness" of the seafood. However I threw out all of those misconceptions once I tried out this dish. Very yummy and you could really taste how fresh the ocean trout was. This was my husband's favorite dish amongst everything that was served. 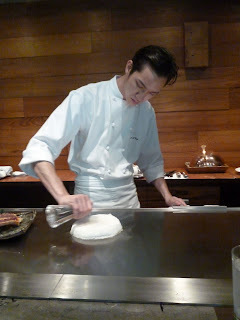 For the main course, Chefy Cory prepared the dishes in front of us (similar to teppanyaki style). 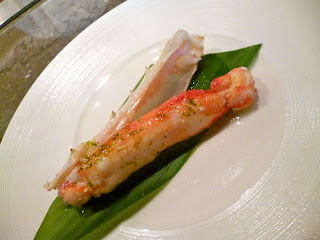 He first cooked for us the Steamed Alaskan King Crab with Lemon-Scented Extra Virgin Olive Oil. This dish was cooked in a bed of salt and some leaves for flavor. Afterwards he added some olive oil which had lemon rind shavings. This seemed like such a simple dish, but the outcome was fabulous. 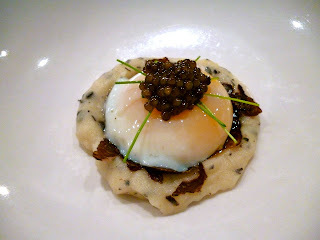 After the crab, we were served Puree of Potato with Soft Poached Egg, Black Truffle and Oscietre Caviar. This was another winning combination. How could you go wrong with poached egg and truffle? Loved this dish as well. 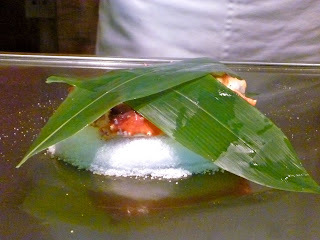 The following dish was cooked on the spot similar to the crab. 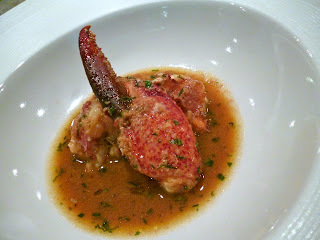 This was the Braised Canadian Lobster with Tarragon. Chef Cory likened the dish to a lobster bisque. The butter in the dish though made it a bit heavy, so it's a good thing the serving portions were small. 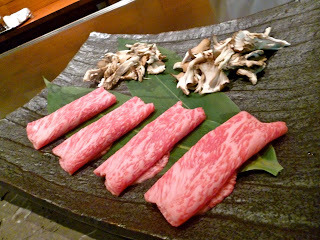 The next dish was what I was waiting for all night -- the Japanese Ohmi Wagyu Roll from Shiga Prefecture with Maitake, Wasabi and Citrus Soy. The wasabi was grated fresh using a special board made from shark skin. 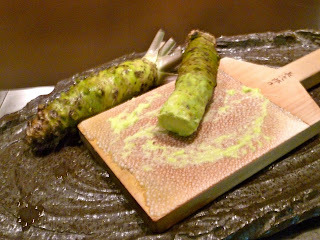 I had never tasted wasabi like this before. It was actually a bit sweet with only a mild kick. The wagyu was cooked to perfection and the rest of the ingredients complemented the meat very well. 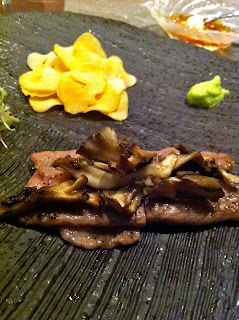 I was actually so excited to eat the wagyu, that I had forgotten to take a photo of it. 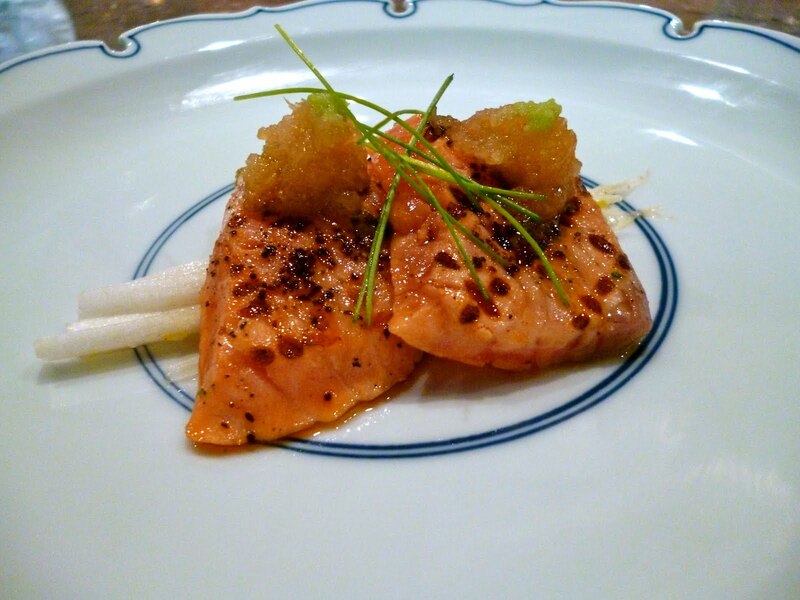 Thankfully one of my friends had taken a photo of his dish and sent it to me so I could post something here. The last dish served at the chef's kitchen was the Consomme with Rice and Snapper. 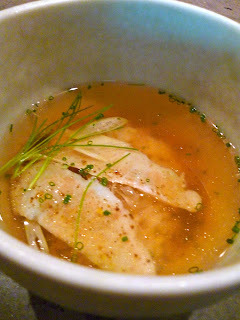 This was a refreshing dish and was more subtle than the rest of the previous dishes. 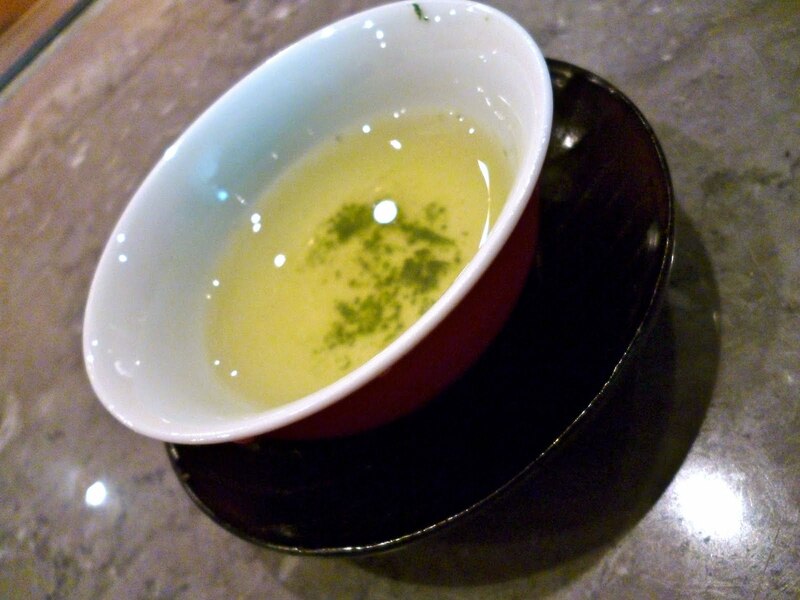 Before moving on to dessert, we were served a special tea called Gyokuro. It was a savory, seaweed-like tea which was very good at cleansing our palate. We were transferred afterwards to the main dining hall where we were served our dessert. 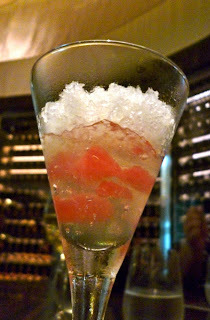 The first was a Granita with Chartreuse Jelly. This was similar to sorbet but the texture was that of a jelly. 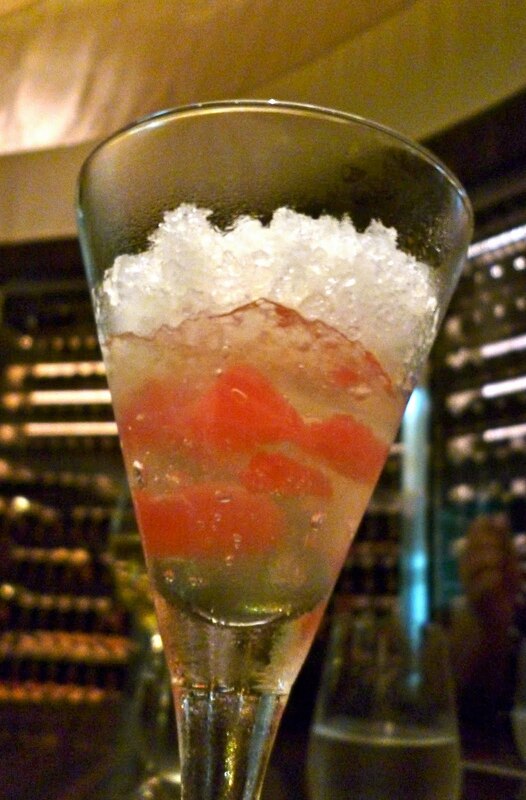 It had a mixture of tanginess and sweetness to it which was very refreshing. The second dessert was a signature dish of Chef Tetsuya. The Ghin Cheesecake was topped with an edible silver, which was explained to us was Chef Tetsuya's favorite colour. This cheesecake was genius!! I am not a fan of cheesecake, but this was one of the best desserts I've ever had. It was so light yet so satisfying. The restaurant manager noticed how much we loved the cheesecake, and she served us another round for free. My goodness, I devoured both cheesecakes in a matter of minutes! Lastly, we were served Coffee and Petit Fours. 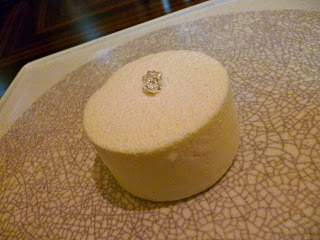 Even the petit fours were excellent. There was French Macarons, Cookies, Meringue, and this Green Tea White Chocolate. Yum yum yum... 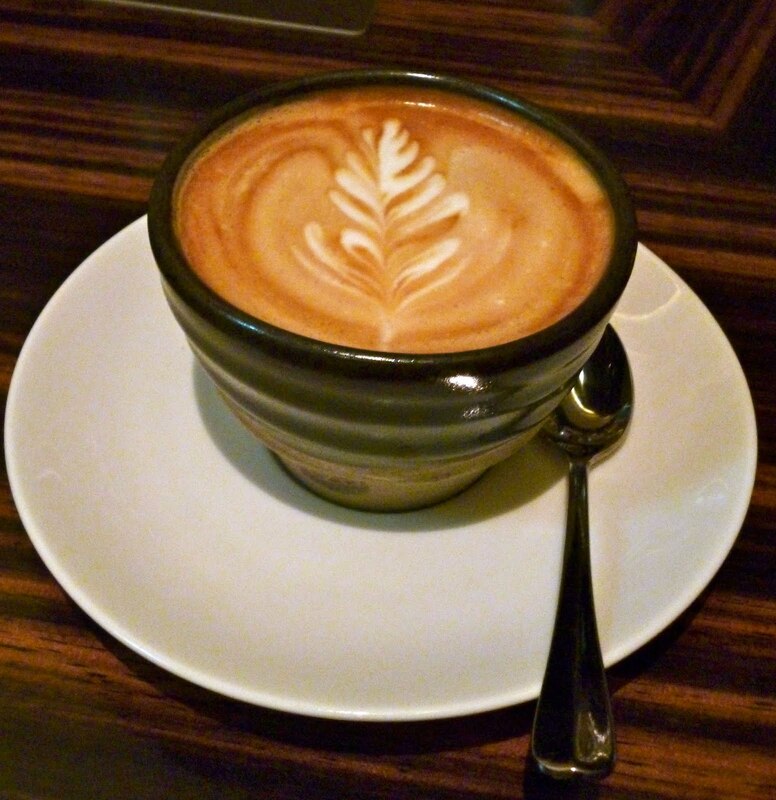 The coffee looked very fancy too. 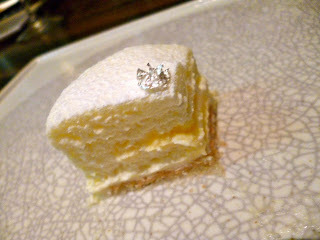 I didn't get to taste it anymore as it was too late in the evening for me to take coffee, but my husband said it was very good too. This entire experience was truly unique. It really played on all the senses. This is every foodie's dream come true! The service was also fantastic. We were very well looked after. Even if the place is very exclusive, you will not feel intimidated at all as the staff is at your every beck and call. I really do recommend this place to all food-obsessed people like me. This is a once in a lifetime experience, so do visit for a special occasion. I hope I will have a chance to come back again soon! Wow. I am in awe just reading about your meal and seeing the pictures. Great pics btw! What cam do you use? Loving the clean look of your blog and amazed you still have time to do a blog while working! =) Galing! Thanks! I use a Lumix DMC-FH2. It's a regular point and shoot camera, but it has some pretty good pre-set scene selections which are great for non-photographers like me. Hi Lisa! They had a very good wine selection. We had white wine since most of dishes were seafood based. My husband's order was excellent and I would definitely recommend it - it was the Alsace 2007 Kritt Gewurztraminer. I even took a photo of the bottle so I could remember it :) If you will be ordering wine like us, the total bill comes out to about roughly SGD 550 per person. great write up and the pictures are great! Can't wait to go next week! Thanks! Very excited for you :-) Hope you enjoy it as much as I did.